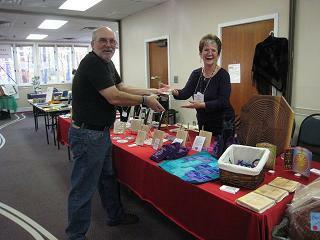 The Vendor/Artisans Area is a great place to display your wares and meet fellow members of TLS. Gael Hees will be coordinating the Vendor Area again at the 2018 Gathering. We look forward to working with the many TLS vendors again next year. Table fees: A limited number will be available on a first come, first served basis. In addition to the table fee, each vendor will be required to pay ten percent (10%) of his/her gross sales to The Labyrinth Society. This payment must be paid at the end of the Gathering, prior to your departure. *Non-registered vendors may not attend Gathering workshops or speaker presentations except by purchasing tickets in those situations when public ticket sales are offered. No meals are provided. Please note: The process for reserving a vendor table is by mail only. You must complete the downloadable form below and send it with a check to the address listed.